@ayijufridar: Since joining Steemit in August 2017 with the account @mariska.lubis, Mariska Lubis has become one of the most significant figures within Steemit Indonesia as a productive community builder. Lubis has a long legacy across social media platforms as a SoMe celebrity, accomplished author, entrepreneur and blogger. At the moment, @mariska.lubis lives in Bandung, West Java, Indonesia. Bandung is a beautiful city with a lot of history and is known as Paris Van Java. She cares a great deal about promoting Steemit in the country. 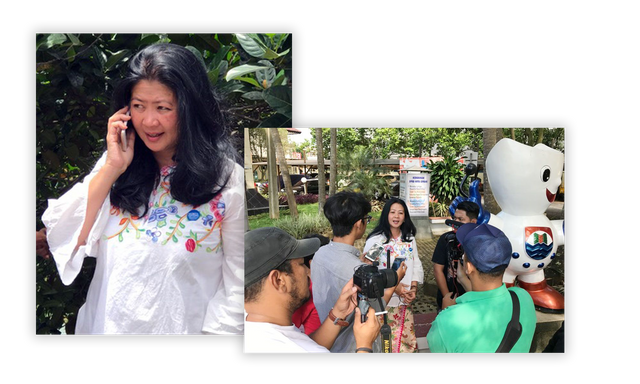 By her hand, the 1st KSI National Meetup in Bandung was born and was attended by hundreds of Steemians from all over Indonesia. Mariska continues her organizational work to leverage Steemit for its Indonesian members. @ayijufridar (AYI): Welcome Mariska! Let's jump right in, you're currently planning for the National Meetup in Bandung with an interesting concept that combines painting, music, and Steemit. What do you expect from that event? @mariska.lubis: My concern is about the social psychological condition of this world, particularly in Indonesia, due to the bad influence of social media at the moment. There are too many destructive hoaxes, spamming, and plagiarism that tries to destroy and disrupt our country and nation. On the other hand, I saw a lot of young people in Indonesia that are very creative and have the ability to create incredible work but do not have a chance to grow for certain reasons. I thought that a National Meetup in Bandung could become an event to get to know each other in much better way for us Steemians who come from different regions, culture, and tribes that lead into unity and collaboration. I really hope the event and everything that will be shown will become an inspiration for everyone to be more creative and productive. And besides, since I know that a lot of media will cover the event and be attended by other people, I really want that meetup to also become a gateway of opportunity for anybody who has their creative work. AYI: How do you feel about the presence of Indonesia within the Steem platform? @mariska.lubis: I am very happy with the Indonesian Steemit Community. Indonesia has the most diverse tribes, cultures, religions, languages, and others that live together peacefully with respect under the same flag. Big thanks to @levycore and @aiqabrago in particular who are the leaders of this community. In short, Indonesia Steemit Community is a place to learn and share everything concerning Steemit. AYI: What should be improved in the Indonesian Steemit Community? @mariska.lubis: Communication is the biggest issue. We have different backgrounds, cultures, experiences, aims, and interests that make all of us have our own “language” to communicate with others. If all members of the community agree with this, than I am sure all will grow faster. I also suggest that we need to think about the way we communicate when we all do promo Steem and Steemit, just to make sure that we are on the same page and decrease the possibility of misinterpretations about Steem, Steemit, and the community itself. AYI: Plagiarism is still a serious problem for the Indonesian community. What should we do to reduce plagiarized content? Do you campaign against plagiarism? @mariska.lubis: My opinion is we must all face the problem head-on. We need to realize that erasing all plagiarized content is very difficult. What we can do is to help decrease it by providing good guidance. We need to remind bloggers that it is not good to “steal.” It is not only against the law and general ethics, but being a plagiarist will not make them successful within Steemit or anywhere else. We could flag repeat offenders together and help them accept responsibility for the risk and consequences of their choices. I despise plagiarism. Since the beginning, I work to share my methods of writing and drawing, not only providing tutorials, but also examples. I always hope that my posts are useful not only by reading them, but also by learning how I present. Some people are strong learners and are willing to listen, but there are a lot out there who are stubborn and need stricter guidance. A lot of Steemians have never written or made any posts previously and it is difficult to give them theories of writing or drawing in general. They don't always get it very easily. I try to teach by example and hopefully they will improve themselves step by step. AYI: Tell us about your efforts to encourage quality content on Steemit. @mariska.lubis: At first, we all should spread awareness that instant money is perhaps easy to get initially, but it will not last long. That is the thing that I always try to teach everybody. Do not be afraid to follow the process and learn along the way. We have to accept it sincerely and with patience if we want to be the best over a long period of time. Overall, these strategies will help us to nurture better confidence as well. Furthermore, I always remind everyone the mission and vision of Steemit. Steemit is not just a social media platform that provides rewards, but also has to potential to create a better global economy. We all are complaining about our conditions in the world today and we all want to have a better life. Then, we all must work hard to help this community to reach its goals by providing good quality content and ideas. AYI: In the past, you have said that you are against autovote applications. Why? @mariska.lubis: This is about respect and honor. I oblige myself to always try to respect others and maintain their honor, as well as mine. Autovotes are perhaps is a very easy way to give rewards and make people happy, but reading and commenting on someone else's post is how I respect them and this is an honor for them as well. AYI: You also use the Steemit platform to promote social activities. What do you do? @mariska.lubis: Yes, I use Steemit for my social activities since I realized that it is easier for people to share and to donate in Steem instead of asking for currency in the real world. Some Steemians and I collected some money for Banten’s Earthquake Victims and also tried to help others who do the same. I also withdrew my rewards from Steemit for my own social activities - I have been working for Tuberculosis, HIV, and STD causes for more than 20 years and the rewards from Steemit really help push these campaigns forward. I don’t need to wait for sponsors or other people to help, but I can count on my own posts and its rewards. I am not saying that I am good, but simply willing to provide an example fo what we can do with Steemit. AYI: What do you see as the future of Steemit? What should we do to strengthen this community? @mariska.lubis: Steemit has a very bright future though we all need to work hard, be patient, and have a high commitment to get there. Steemit is a new thing that is different from other social media before, no doubt. Steem and the Steemit application has a lot of challenges that have to be faced, especially related to politics and economic competition. I hope all stakeholders and investors of Steem realize that we all need to work with each other. We need to encourage the community to grow faster and stronger collectively. We also need to have people involved in politics to approach governments with diplomacy, lobbies and events which need to be supported by Steemit. We cannot deny that business is about politics and when we are talking about money and changes, it means we are talking about countries and governments as well, not just wealthy people. AYI: When Steem and SBD price are falling, the spirit of Steemit also goes through ups and downs. What do you think about this? @mariska.lubis: For me, this is a proof that a lot of Steemians do not really understand the currency; Steem. They see Steemit as just tools for their own benefit and purpose, not thinking about others and what we are actually trying to do. This is sad but also represents actual social conditions, where most people are not thinking further or beyond, but just thinking about what what they want and need today. Modern people will think further and beyond, and always have a strong will to fight. In this case, what we have to do is conquer ourselves and keep the spirit alive. When we cannot do it, then it means we are losing. On the other hand, if we can do it, it means we are champions. AYI: At last, what is your message for all Steemians in the world? @mariska.lubis: Let’s have a better world and future with Steemit. Be the best and do the best for all. Want to support Steemit authors like these? Consider joining our curation trail! You can learn more about the @sndbox incubator mission and 2018 program here. Help us spread the word. Follow our Twitter and YouTube Channel! Thank you @sndbox for always having great programs to help and encourage people to do better and the best. I feel honor to be interviewed by one of our senior journalist, writer, and Steemian, @ayijufridar and to have this interview published by @sndbox. I just hope that what we all trying to do in Steemit could help this world into a better place to stay. sebuah wawancara yang baik dan banyak memberikan manfaat bagi pembaca. Fungsional dalam artian lebih luas, baik itu steemians nya atau dampaknya pada masyarakat secara langsung sesuai Agenda yang dilakukan. Cara pandang @mariska.lubis kelihatan terbuka dan dia bepikir makro, artinya bagaimana steemit dapat dijadikan penyaluran ekspressi dengan konten yang terarah serta origonal, serta bagaimana pentingnya pula penyaluran hasil yang didapat dari rewards kepada masyarakat atau komunitas yang membutuhkan. Sikap dan cara pandang yang baik akan menjadikan para steemian mendapatkan kepuasan tersendiri. Apalagi kalau berhasil mempertahankan konten yang baik dalam setiap postingan. Terimakasih @sndbox atas postingan yang mencerahkan ini, tetimakasih @ayijufridar dan @mariska.lubis yang telah mencoba utk membuka mata dan pandangan baru bagi para steemians. Tentu pula ungkapan salut kepada @aiqabrago dan @levycore serta steemians pendahulu lainnya yang telah berusaha dengan susah payah untuk menegakkan bendera KSI. I love this interview and enjoyed reading her views about the steem blockchain. However , I was particularly interested in the topic of plagiarism. She has spoken well but I feel eradicating plagiarised content is very easy. I have a friend who got someone onboarded on steemit and what the person dis was plagiarise in every of his post. I mean 100% plagiarism and nobody noticed. As a matter of fact he was getting Curie upvotes on all his posts and thisbgot his friend, who has great love for the community, worried. What he did was to report him to steem cleaners and for every of the guys post, steem cleaner would leave a warning Noto and would flag the post and he couldn't make as much as he used to make befor and he soon changed his ways and started putting up great contents. I believe we should report and perpetual plagiarised we see on the platform and leave steemcleaners to handle them. @mariska.lubis ... that's truly inspiring ! great to see individuals like yourself onboard. That was a nice interview.She is very focused on her goal and plan.I am sure she will do better in future.Spreading steemit will help steemit to be even better. @sndbox sir you are always trying to do something for the platform.Thanks for sharing wih us. Bagi yang tak terbiasa menulis like me, mempertahankan suatu postingan yang baik di platform steemit ini bukanlah hal yang mudah. Butuh banyak bimbingan dan masukan dari para Steemians senior. Membuat postingan yang mencerahkan tak semudah membalikkan telapak tangan bagi saya pribadi sih hehe. Dan saya sangat mengapresiasi kegiatan sosial telah dimulai oleh Bu @mariskalubis. Kerja nyata yang memberikan teladan yang baik bagi kita untuk menjadi Steemians yang berguna bagi sesama yang bisa dilakukan dengan menggunakan platform ini. Tararengkyu buat pak @ayijufridar dan ibu @mariska.lubis yang telah mencoba utk membuka mata dan pandangan baru bagi para steemians like me khususnya. Wah, ini keren, luar biasa, saya berpikir bahwa @sndbox adalah sebuah akun bot yang hanya aktif saat ada postingan dari member steemit, ternyata asumsi saya slama ini salah. Saya benar-benar terkesima dgn postingan ini, saya benar-benar tidak menyangka ada moment wawancara yang terjadi antara kakak @mariska.lubis dan bang @ayijufridar. Terimakasih @snbox sudah sharing informasi ini, membuat saya semakin semangat untuk ikut membanti membangkit para newby di steemit, terimakasih. Ini keren banget. Saya mengenal baik kedua steemian ini, bang @ayijufridar dan @mariska.lubis. Mereka dengan dedikasi penuh tanpa pamrih, membangun komunitas steemit di Indonesia. Wow! Many thanks for @ayijufridar and @sndbox that made this interview happened and packaged in this inspiring post! I've been amazed at this lady since the first moment I met her. She is a smart and open minded person who has a strong willingness and commitment to educate people for a better understanding about steemit, and do support them/steemians in how to play smart, safe and properly on this platform. She is inspiring. Thanks again, @Sndbox and Bang Ayi! 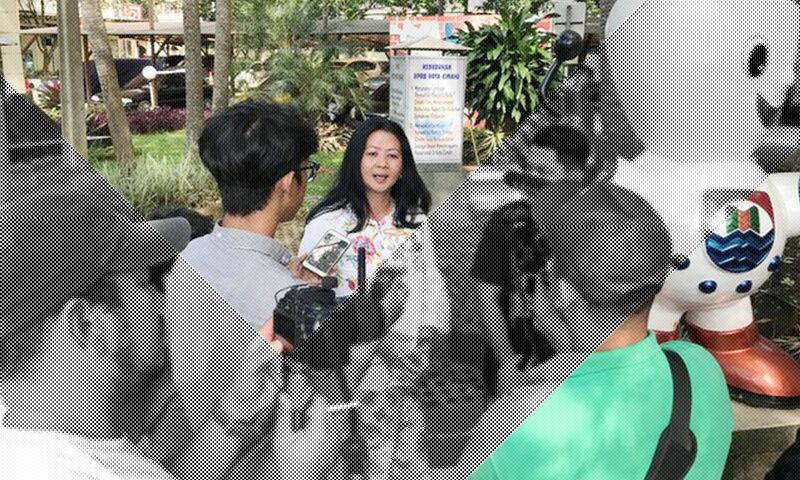 Kak @mariska.lubis tepat memanfaatkan steemit sebagai media untuk mengajak orang banyak menjadi aktivis sosial. Itu yang kami tiru untuk membantu korban bencara erupsi gunung sinabung di Sumatera Utara. Untuk bg @ayijufridar, kami masih butuh waktu mengembangkan keterampilan menulis dari para pendahulu di dunia steemit. Dukungan moral akan sangat membantu. Terima kasih. It was a pleasure to meet @ mariska.lubis is a person with a great heart and is right when he talks about some steemit personalities that only seek personal benefit without thinking about others or the platform, this is impossible to stop, let's hope that steemit will grow more and more that the voice of steemit will sound in all corners of the world. With God's favor, it will be like this .. I like the way of view @mariskalubis seems open and he thinks macro, which means how steemit can be used as a channel of expression with targeted and original content, and how important is the distribution of results gained from rewards to communities or communities. in need. I'm one of the @sndbox lovers. His programs have grown and empowered many people. I as the Community Empowerment Facilitator very salute and give appreciation and award as high-tuktya to @sndbox, curator of Indonesia @aqabrago and @levycore. Thank you very much. Thanks to the curator's guidance, we can be like today. I see. Kak @mariska.lubis like a mother of indonesia steemian. She give us all of spirit what she have. When i meet for the first time. Kak @mariska.lubis give us a good smile to make a friend zone or family maybe. And thanks to Bang @ayijufridar who the first speaker in 1st Meetup KSI Chapter Jakarta with Mr. @razack-pulo. I hope, God bless us. Selalulah menjadi cahaya @mariska.lubis untuk menerangi kegelapan. Apa yang kamu lakukan di Bandung dan Indonesia, selalu menjadi inspirasi buat kita. Mudah-mudahan Tuhan memberkahi dan selalu menjagamu, selalu.